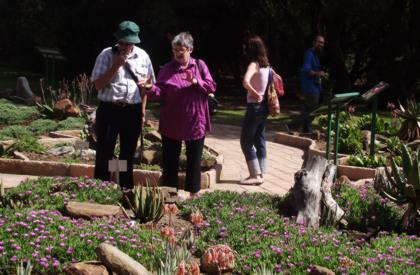 The aim of this Garden is to introduce visitors to some of the succulents found in South Africa’s nine provinces. The layout of the Garden resembles the outline of the nine provinces. Each bed represents a province and plants are carefully selected to represent the succulent flora of that province. The Succulent Garden serves an important role in environmental education for visitors and scholars, teaching them about succulents and their distribution range in South Africa. This garden depicts the various biomes found in the provinces of South Africa and the succulents to be found in these biomes. About 200 different succulent species and 43 genera of succulent families have been planted in this garden. Among these are Aloe spp., Crassula spp., Euphorbia spp., Haworthia spp., Bergeranthus spp., Stomatium spp. and Delosperma spp. Succulent plants are specially adapted to survive in dry, arid environments and can conserve water in special water storage cells in thickened or swollen leaves, stems or roots. Water storage tissue consists of large cells with thin cells walls that can expand or shrink depending on the availability of water. Some succulents have waxy, round, small, compact or grey leaves. Others have spines that are modified stems, for example Euphorbia spp. They usually have shallow root systems to soak up rainfall effectively. 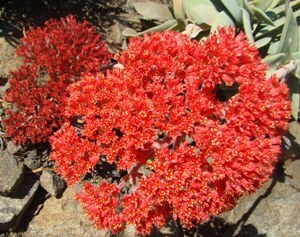 Not all succulents are related, and in southern Africa there are almost thirty plant families whose members are partly or entirely succulent. Environmental forces are the main reason why unrelated succulents have the same appearance. Visit SANBI’s plant information website for more information on plants in our Garden.